Over the past year its developed a very interesting feature, corky bark similar to the potential air layer branches in the first couple of photos. 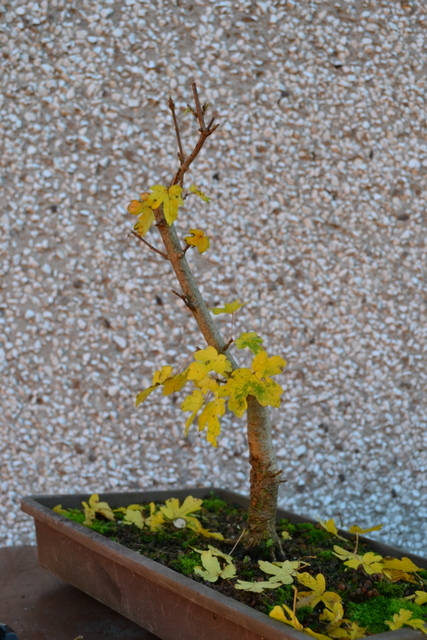 I had always thought of field maple as having smooth bark, even when mature but a while ago a friend showed me an unusual bonsai tree that at first sight I thought was a winged spindle. 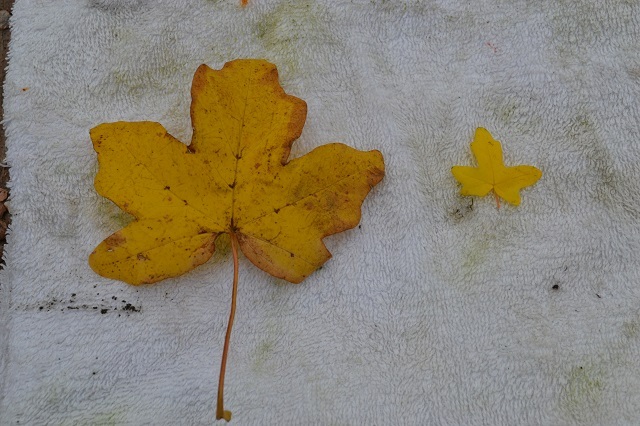 Turns out that it was a field maple! Seems I’ve got the same cultivar growing here? However it is interesting to note that this only appears on the branches and not so much the trunk. The trunk is showing a bit of maturity with its textured surface but not so much cork like. Strange. 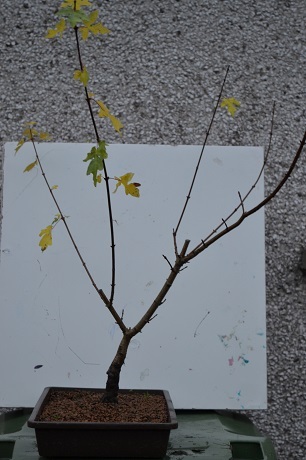 I think I’ll air layer the top of this tree as its needs reduced anyway. Time to lop off this sacrifice branch in preparation for developing branch structure next year. 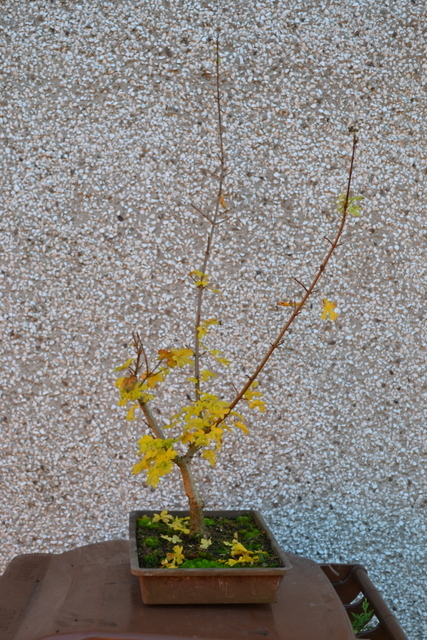 I mentioned in a previous post that I have a mature ,full size Field Maple (Acer Campestre) growing in the garden and this has produced many seedlings that self sow around the place. 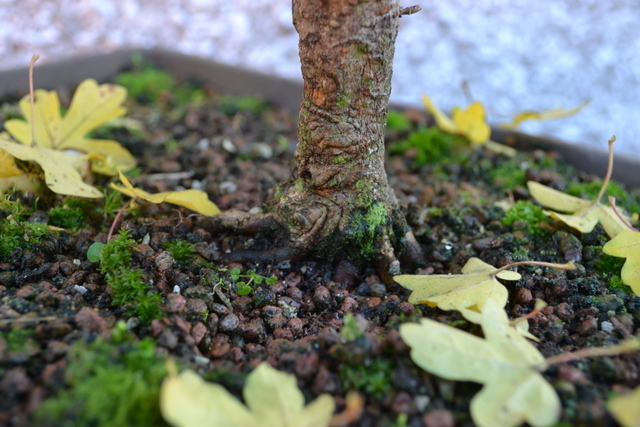 The last few years I’ve been growing some of the biggest seedlings in pots and they are now at the stage where they can start to be trained as small bonsai material. 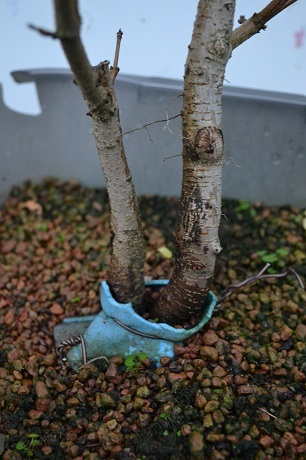 This (above) will be trained as a single informal upright after I discovered it had fantastic surface roots. 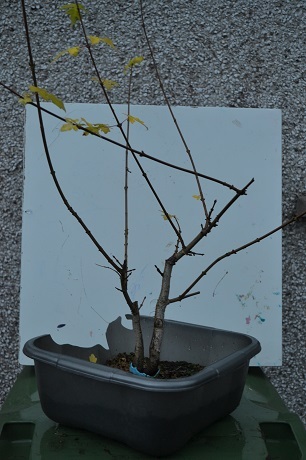 Some long branches were retained to promote thickening. I haven’t decided which trunk line to keep yet. 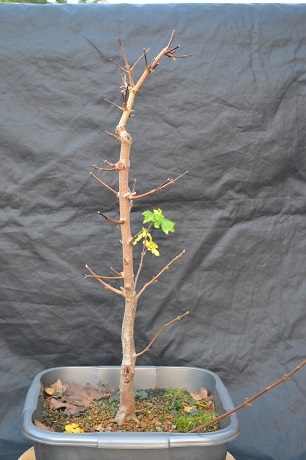 This is a twin trunk project assembled from two saplings earlier this year. I started this simply because I wanted to try something new with two unpromising pieces of material. Hopefully the project shall be a greater success than the individual trees used but I know it shall take a long time. The two have hopefully started to fuse cambium layers and shall remain in this tub to encourage the formation of a solid unit for the next number of years. 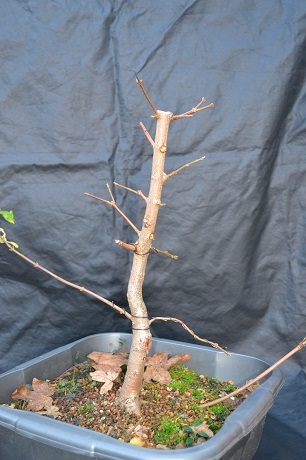 Free growth this year to recover from rootpruning. 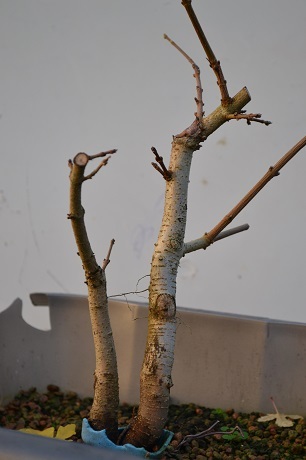 I realised that the uppertrunks were growing in different directions so I have clipped most of the extended branches back and will keep the minor trunk about the same height, with the major trunk being allowed to grow about another third taller. 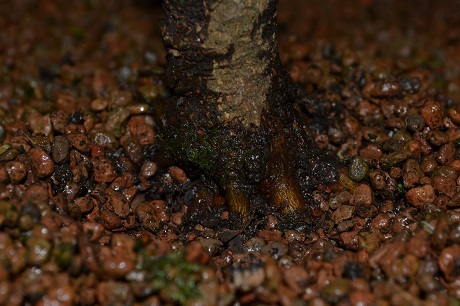 This is the largest of the field maples that I have with a base of 3cm. The surface roots aren’t bad but are in the process of being improved by ground layering a branch that popped at the base last year. You can see it extending off the right of the pic. 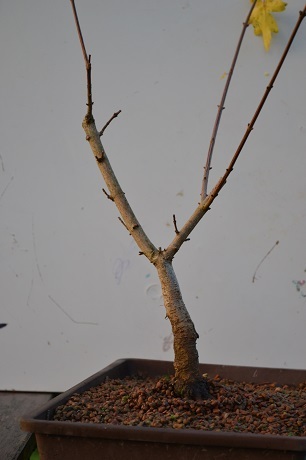 At the start of this year I wasn’t happy with the existing branch arrangement so I cut off all the branches and started with the bare trunk. It’s taken a while to recover but I’m happy with the new growth and managed to get a new low branch at the bottom right and this shall be the primary branch. It was loosely wired down, along with a branch at the back. The first branch on the left is a sacrifice branch for thickening the trunk. I felt the trunk was too tall and straight so I reduced it. It’s still pretty straight with little taper along most of its length so I’m going to encourage a lot of lower branch growth over the next two seasons and keep the apex growth very short. I’ve kept an extra branch on the left that forks because it could be used as a new leader if I’m still unhappy with the lack of taper in future. 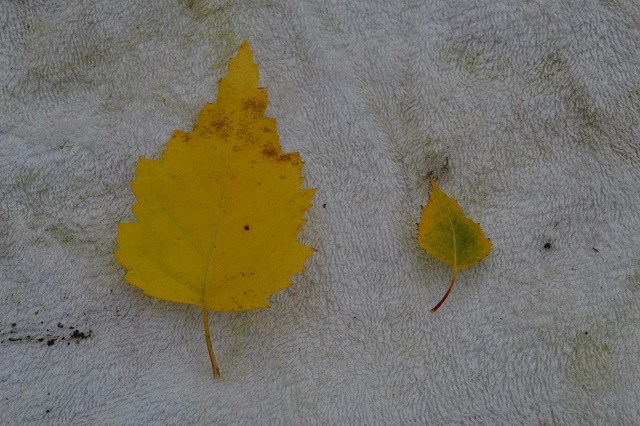 I have quite a few self sown seedlings cropping up around my garden due to a full size birch next door and a full size field maple in my garden. Over the past few years I’ve been growing/training some of these as future bonsai. It’s fascinating to see the size difference between full size leaves and the leaves of bonsai material grown in shallow pots.